Explore our catalog of educational animal-oriented products. 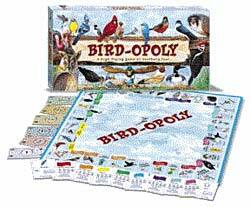 BIRDOPOLY is a game based on our fabulous feathered friends. It has all the fun of a traditional property trading game with some fancy flying twists and turns. The game features backyard, rare, and favorite birds of North America and each Bird Deed is filled with fun facts about the bird. When playing the game you can choose to be, among others, a hummingbird, a birdbath, or a pair of binoculars! Trade your bird houses in for a big tree and you?ll be the big winner in Bird-opoly! Game play is for 2-6 players, ages 8 and up. It takes about 1 hour to play. 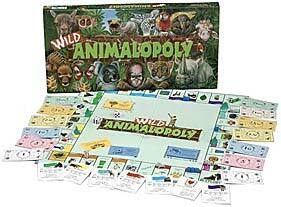 All the fun of a traditional real estate trading game plus some wild animal twists. Instead of buying property, players become Caretakers of animals. Instead of rent, players pay Meal Fees. A player collects 4 Elements - the land, water, food and clean air that all animals need to survive and trades them in for a Habitat where an animal can survive on its own. Flip over the Animal Certificates and you'll find several fun facts about each animal. Did you know a polar bear has coal-black skin? Or that a flamingo is pink because it eats shrimp? How about the fact that a giraffe hoof is the size of a large dinner plate? It's all fun and games until you land on HIDE FROM PREDATOR... then it's time to run to HIDING and you're out for 3 turns! So grab your token and advance to EXPLORE. Who knows? You may become the caretaker of a two ton rhino. Or you might get fleas! Whatever Happens... It's howling good fun! IT'S WILD!